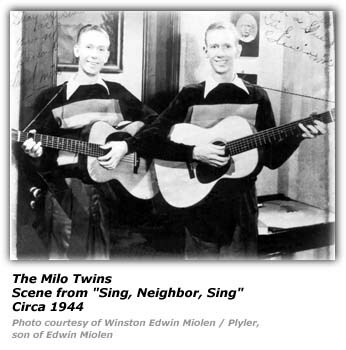 Edward and Edwin Miolen were known to country music fans as the Milo Twins. They were born five minutes apart in Copperhill, Tennessee. They were in fact identical twins. In adulthood, they were both about the five feet ten inches and about 125 pounds, with auburn hair and brown eyes. It was said that even their best friends had a tough time determining which twin they were talking to or dealing with. Thy lost their mother and father when they were youngsters. They attended school at the Tennessee Industrial School in Nashville. However, no mention was made of who they were with during those years in terms of guardianship. The boys developed a musical interest in their early years. They would find whatever work they could find in terms of odd jobs, farm work to help them survive and ultimately, a couple of guitars for themselves. They got their guitars and began to practice until they felt they were good enough to display their talents to the world. They began the effort to start their musical careers, finding places to play anywhere they could if only to make a few dimes to allow them to eat a meal or two that day and find a place to sleep. For any musician, let alone a hillbilly musician in the late 1930s and 1940s, it could be a rough way to a level of recognition that began to pay off for the effort. During 1938, the were able to secure a job with radio station WLST in Atlanta. One can read author Wayne W. Daniel's book on country music history in Atlanta, "Pickin' on Peachtree" to see what kind of musical history the town was generating back then. Like many artists back then, the radio was not the primary source of their income. The musicians used it to help them get heard and promote their personal appearances they would make throughout the broadcast area of the radio stations they worked at. One article we've seen indicates that in the 1930s acts such as the Monroe Brothers, Blue Sky Boys and Riley Puckett were working in the Atlanta area. That era was also an era of what might be termed "brother duets" as we've seen it described. Consdier who else was popular at the time - The Delmore Brothers (with whom they are sometimes compared to), The Shelton Brothers, York Brothers and the Callahan Brothers. On September 1, 1939, the Milo Twins were in Houston, Texas to record; a session which led to their first release on Decca - "Quit Treatin' Me Mean b/w "Ain't It Hard (To Love One That Don't Love You)". Dorothy Milo wrote columnist Constance Keith back in late 1941 that the Milo Twins had 'settled down' and were working at radio station WMBR in Jacksonville, Florida. They had a daily half-hour show, sponsored by the RC Cola company from 1:30pm to 2:00pm. Their group of entertainers back then included Miss Rita, who was formerly known as Lancy when she was part of the Kelly Sisters. She was also the wife of Edwin Milo. The act included a fellow by the name of Little Abner who did the comedy and a steel player known only as Willie. Ms. Keith noted that the Jacksonville stint was quite an opportunity for them as there did not appear to be much competition on the air at the time. 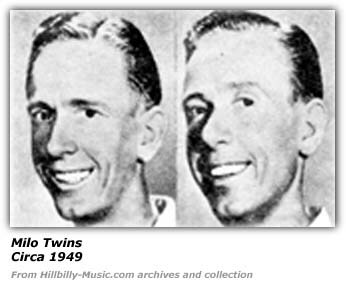 Floy Case was reporting in 1945 that the Milo Twins were a part of the troupe of entertainers associated with Tex Ritter. Other acts with Tex at that time were Laura Lee Owens, Max Terhune, Bonnie Dodd and Slim Andrews. 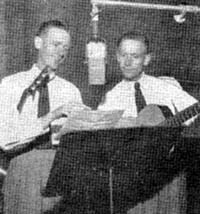 Sunny Ciesla wrote in 1947 that the Milo Twins were then a part of a group of entertainers touring with Cottonseed Clark, breaking attendance records up in the northwest. That touring group included Ken Card, Scotty Harrell, the Sunshine Girls and Irene Duncan. In March of 1948, they were making their home in North Hollywood, California. By then they had appeared in several movies. In one movie, "Sing, Neighbor, Sing", which starred Roy Acuff, the Milo Twins did one of their compositions "Durn'd If It Ain't My Soul" (or was performed by another artist or group, the article wasn't that specific or clear when it mentioned this. They also appeared in "I'm From Arkansas" and "Marked For Murder". During early 1948, the Milo Twins were on an extended tour back east - to the Carolinas and other southeastern locations. Merle Travis was the headline act on this tour. We learn in a late 1948 article that when the Milo Twins were working in Dallas, they appeared on a show hosted by a fellow known as "The Insomnia Kid", Fred Edwards - the Midnight Jamboree over KRLD. Edwin died in 1965 in Boston, Massachusetts after a battle with throat cancer. After Edwin's death, his brother, Edward, moved to Dalton, Georgia, where he lived the remainder of his life before passing away in 1978. 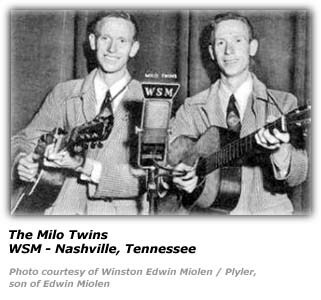 Hillbilly-Music.com wishes to thank Winston Edwin Miolen / Plyler, son of Edwin Miolen, for contacting us and providing us with information, articles and pictures of the Milo Twins career.